BMC Fall 2019 Applications NOW LIVE! Espen Slettnes Wins First Place at 2018 Broadcom MASTERS and Receives Minor Planet named after him! Our very own seasoned math circler Espen continues to reap awards. Among more than 900 winners from regional science fairs in California, he went on to win both the 1st prize in Mathematical Science as well as Project of the Year Award across all categories in the junior division at the 2018 California Science and Engineering Fair. In other math-related fields, he received a bronze medal at 2018 USA Physics Olympiad (USAPhO). He is also competing in the Gold division of the USA Computing Olympiad (USACO), having easily aced the Bronze and Silver divisions last year. He has also been accepted as one of 45 pre-college students worldwide to form the inaugural cohort of World Science Scholars, a new initiative to nurture the next generation science researchers, led by Professor Brian Greene of Columbia University. The scholars will explore a broad range of new disciplines expanded from mathematics. The video above includes footage from MAA MathFest 2018 in Denver earlier this month; near the end, Espen is talking to Dr. Michael Pearson, executive director of MAA. More recently, Espen won first place (out of 80,000 middle school students who competed) at 2018 Broadcom MASTERS! This competition is the premier science and engineering competition for middle school students and is a national science fair organized by The Society for Science and Public. He was also selected out of a gifted, national applicant pool to be named as a Caroline D. Bradley Scholar. He will receive a merit-based scholarship for high school. MIT Lincoln Laboratory also just named a minor planet after Espen to recognize his achievements. His name will be added to the Minor Planet Center database (run out of the Smithsonian Astrophysical Observatory in Massachusetts). Look out for Minor Planet 34379 Slettnes in the sky! Espen at the 2018 Broadcom MASTERS competition in Washington, D.C.
Zach (in black shirt) and Ave (in black cardigan), seasoned circlers, return to BMC with Bronze Award (for Zach) and Merit Award (for Ave), in the individual rounds at the World Mathematics Team Championship, held in Thailand in November 2017. Congratulations to this brother-sister team and thank you for continuing to reinforce the BMC name on the map. Welcome home! Vinayak returns to the Circle with a gold medal around his neck, placing 5th individually in the Advanced Division at the World Mathematics Team Championships. Congratulations, and welcome home! Seasoned circler and alumnus, Laura Pierson, keeps going on her mathematical journey with great success. She placed in the top five at the Math Prize Contest in 2016 among all girls in the U.S., earning herself a gold medal. This year, in the Regeneron Science Talent Search, she has been named the Top 300 Scholar. Her talent also earns her a spot in the top 40 finalists to compete later in the year. We look forward to hearing good news while cheering for her on this journey. Bio: Laura is currently a senior in high school and still connected to BMC. She coordinates the Monthly Contest and the awards. She has also given lectures at the Circle. Laura won the USAJMO in 2015 while she was in 10th grade, placing in top 12. In 7th grade, Laura, being the youngest member of the USA team, won a silver medal at the European Girls' Mathematical Olympiad (EGMO) in Luxembourg. BMC Alumnus published his first Geometry textbook! A familiar face at the Circle, Evan Chen, has recently published Euclidean Geometry in Math Olympiads through the Mathematical Association of America while still attending MIT. You can read more about his book here. Bio: Evan won a gold medal in the International Mathematical Olympiad (IMO) over the summer of 2014! He represented the Taiwanese team (which came in 3rd). Evan actually came in second at the USAMO earlier that year, the final round of the USA Olympiad. Evan finished his freshman year of college at Harvard and is now starting his sophomore year at Massachusetts Institute of Technology (MIT). Evan will be in contact with the BMC through his Monthly Contest problems. Berkeley Math Circle student Evan Chen, also the coordinator for the Monthly Contest at BMC for the past three years, solved all six problems at USAMO (the last round of the USA Math Olympiad). He was placed #2 in the USA with 41 points and was among the top 3 winners awarded with Akami Foundation Scholarship! Even more astonishingly, he qualified at the same time on the Taiwanese team and participated in the International Mathematical Olympiad this summer in Cape Town, South Africa, from July 3-13 , 2014. Evan Chen graduated from lrvington High School in Fremont, CA, this year and will attend Harvard College in the fall. 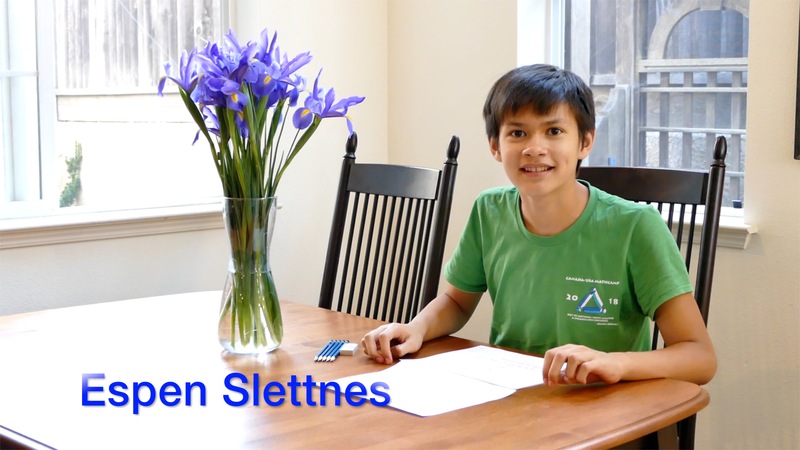 Evan earned a Gold medal in the 2013 Asian-Pacific Math Olympiad, and will be participating on the Taiwan team at the 2014 lnternational Mathematical Olympiad (lMO). He enjoys programming, typesetting documents in LaTeX, and playing StarCraft on the nights before major contests. Evan applies his skill as a competitor in mathematical competitions to writing mathematical problems. Evan thanks his teachers, Miss Chiu and Mrs. Rothfuss, for their continual support and Dr. Zvezda Stankova, of the Berkeley Math Circle, for her invaluable mentorship. lt is noteworthy that Evan took this USA Mathematical Olympiad (USAMO) in Taiwan from 12:30 a.m. to 5:00 a.m. while in Taiwan. BMC student Espen has written a beautiful poem called "My True Number". We wanted to share as it is quite appropriate for the Berkeley Math Circle! Please do not take out the poem without copyright. My shadow and I stood in a complex plane. "What value are you?" I winked and asked. "3435i", said he, and he asked me mine. I said I was 33+44+33+55. "That's what I am, but times i"he replied. in the silence of ∞, where I saw my true self. I spoke no words but the simple language of the universe. The complex plane is a way to represent all complex numbers in 2 dimensions. A complex number is made up of a real and imaginary part. Tertiation is repeated exponentiation, which is repeated multiplication, which is repeated addition. Copyright © 2014 Espen Slettnes. All rights reserved. Berkeley Math Circle featured on "The Monthly"! The Berkeley Math Circle has been featured "The Monthly," East Bay's Premier Magazine of Culture and Commerce, titled "Proving Their Passion" by Sarah Weld. Check out the Berkeley Math Circle on the news here! Nico Brown of the Berkeley Math Circle wins first place at the Berkeley Mini-Math Tournament! Nico Brown wins 1st place at BmMT 2013. Nico Brown and Vincent Pisani at BmMT 2013. BMC's own Nico Brown won the Berkeley mini Math Tournament (BmMT), the middle school student variant to the BMT for high school students, this past weekend. Nico's score in the Individual round placed him into the top six students who entered the final Countdown elimination round, a series of timed questions... and he emerged the overall champion! He wouldn't have got there without Team BMC coached by Intermediate Circle parent Tor Slettnes--Vincent Pisani, Arav Karighattam, Nate Fish, Espen Slettnes, and Nico--so congratulations to all!